If your Samsung dryer will spin but will not heat, a burnt heating element could be your issue. A bad element on Samsung dryers has been quite common with some of the newer dryers. 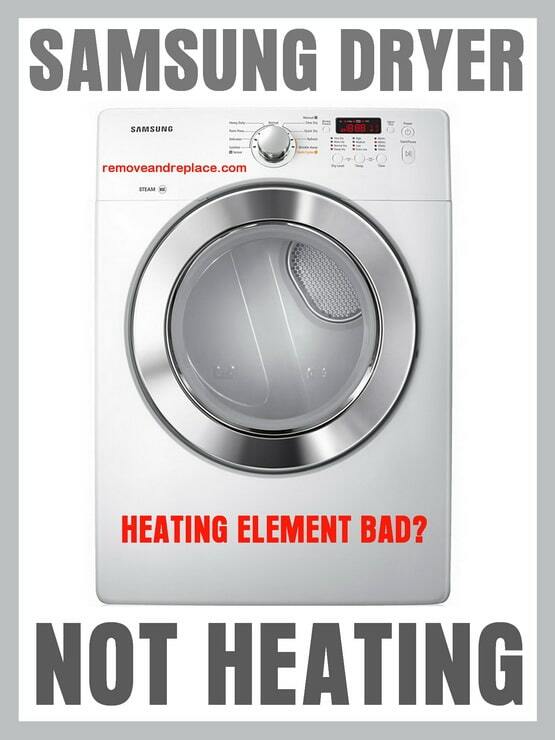 However, you need to do some further testing to be sure the element is causing your Samsung dryer to not heat. The Samsung dryer may have a bad thermostat, thermal cut out fuse, clogged air vent line, incorrect voltage, faulty heating element, or other internal wiring issues. NOTE: If your Samsung Dryer is getting an error code, check here for Samsung Dryer Fault Codes. When your Samsung dryer will not heat, BE SURE YOU HAVE CLEANED THE VENT LINES AND LINT FILTER as a clogged vent line will cause your Samsung dryer to NOT HEAT properly. Check all parts of the dryer to be sure what is causing it NOT HEATING. Check thermostats, thermal cut off fuse, wiring, voltage, and vent line. If you have tested ALL aspects of the dryer and have found that the heating element is what is faulty, here is how to replace it. Remove power from your Samsung dryer. Remove the screws on the back of the dryer. Remove lid by sliding it off. Remove the control panel off by lifting upward. Remove wire harness holding the control panel to the dryer. Remove 4 screws that secure the front panel. Open dryer door and remove 2 more screw at the base of the door. Depress the locking tabs and remove the front panel. Disconnect the door switch wire. Disconnect the moisture sensor wiring harness. Remove screw that holds the heating element housing. Remove housing from mounting bracket. Remove screws that hold mounting bracket to the base. Pull heating element housing out of the dryer. Disconnect the wire harness from the heating element. Do not remove the wire harnesses from the thermostat or high limit switch. Remove the screws holding the thermostat and high limit switch from housing. Remove the screws that hold the heating element housing together. Bend the tab upward and separate the heating element housing. Replace the faulty heating element with the new heating element and put everything back together using this guide in reverse. Instructions for replacing the heating element on your Samsung dryer. Dryer is not heating, gets too hot, takes too long, trips the breaker, or won’t stop heating. How does the heating element in a Samsung dryer work? 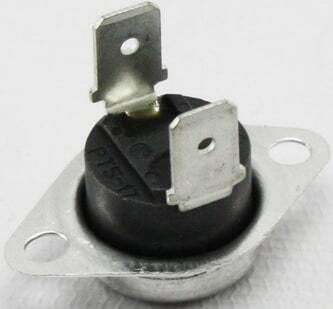 The Samsung heating element DC47-00019A works when a switch on the motor turns on. The element will then glow red and heat the dryer. When the dryer falls down below a certain temp, the element turns ON and begins to heat the dryer once again. This will repeat over and over until the cycle is complete and the clothing is dry. Why did the heating element on my Samsung Dryer go bad? If your dryer heating element is burnt or faulty, something else within the dryer may have caused this. Check the vent exhaust for lint clogs. A lint blockage issue can cause your heating element to burn out. What else can cause my Samsung Dryer to NOT HEAT? This Samsung dryer heating element will work on clothes dryer model numbers: DV306BEW, DV306LEW, DV316BEC, DV316BEW, DV316HEC, DV316LES, DV316LEW, DV317AEG, DV317AES, DV317AEW, DV328AEG, DV328AER, DV328AEW, DV330AEB, DV338AEB, DV330AEW, DV331AER, DV331AEW, DV337AEG, DV337AEL, DV337AER, DV337AEW, DV338AEW, DV339AEG, DV339AEL, DV339AER, DV339AES, DV339AEW, DV340AEG, DV340AER, DV350AEG, DV350AEP, DV350AER, DV350AEW, DV393ETPARA, DV393ETPAWR, DV395ETPARA, DV395ETPAWR, DV3C6BEW, DV405ETPASU, DV405ETPAWR, DV407AEW, DV409AER, DV409AEW, DV409SEL, DV410AER, DV410AEW, DV419AES, DV419AEU, DV419AEW, DV428AEL, DV428AEW, DV431AEP, DV431AEW, DV438AEL, DV438AER, DV448AEE, DV448AEP, DV448AEW, DV456EWHDWR, DV484ETHASU, DV484ETHAWR, DV501AEW, DV5451AEP, DV5451AEW, DV5471AEP, DV5471AEW, BED70B, BED70W, DV203AES, DV203AEW, DV206AES, DV206LEW, DV209AEW, DV210AES, DV210AEW, DV218AEB, DV218AES, DV218AEW, DV219AEB, DV219AEW, DV220AEW, DV221AEG, DV221AES, DV229AEG, DV231AEW, DV2C6BEW, MDE6700AYW, MDE6700AZW, MDE9700AYM, MDE9700AYW, MDE9700AZM, MDE9700AZW, NED7200TW, YIED7200TW, and YNED7200TW. 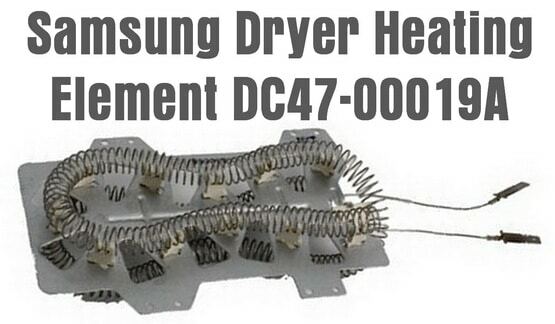 Need help replacing the heating element on your Samsung Dryer? Please leave a question below and we will write back with the easiest ways to replace your dryers heating element or any other parts. Hello, my dryer is not heating. I vacuumed and cleaned lint lines and replaced the heating element, thermostat, and fuse. It is still cold. Any other hints or things to try? I’m stumped! Samsung dryer dv80h4000cs is not heating properly. When i open the back cover i see the heàter is not completely heating. When i cover the blower the heater works completely and when i remove the cover same problem, not heating. Samsung DV400EWHDWR/AA electric dryer not heating up at all. Checked and No blocked venting ducts in wall or hose. No error codes. Replaced whole heating duct element with both sensor and thermostat. Worked fine for 1 week then exact same problem again. What else could it be? did you ever figure out the problem? I too replaced the heating coil, thermostat, and high temp fuse. It did work for 2 days then quit again. I replaced fuses again and then finally got my meter out and checked resistance on the thermostat, fuse, and heat coil and all are good. So that is not the problem. No error messages. Runs but no heat. Thanks for any info. We have a Samsung dryer (DV328AER/XAA) and a couple weeks ago it stopped heating. We have replaced the thermostat, the thermistor, the thermal fuse, the heating element and the control board all to no avail. It is not displaying any error codes, I have checked the vent, nothing is blocking it (though a child’s swim bottom and a credit card from the previous owner had somehow made it’s way into the vent before we replaced all the pieces and parts). Any suggestions on next steps? We’ve been without a dryer for a few weeks, so this is getting to be more than a little ridiculous. My Samsung Dryer spins but only blows cold air. I replaced new heat element, thermostat and thermistor, and still no heat. I was wondering if you found the issue with your dryer after knowing the coil, thermostat, and high temp fuse all tested good? Our dryer stopped heating today and I see multiple accounts similar to yours. Just hoped to know a little more before I begin the repair process. Thanks for your help! I’m in the same boat. Changed out all three components. It worked for 2 loads and stopped. I’m really too broke to call a repair shop or continue chasing my tail. Help! Samsung dryer would not heat. Thermal fuse was bad. Replaced it. Now dryer will run for 3 or 4 minutes and shut off with tone as though clothes are dry. I’ve checked all ducts where there is airflow for blockages and found none. Disconnected vent to outside and ran dryer with same result. 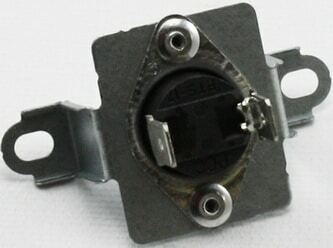 Have continuity on both high limit and thermostat fuse. Any ideas? I certainly looked at all requirements that was listed and yet my Clothes Dryer still blows cold air. When the vent hose is not connected you can feel the heat but when connecting the hose and put my first load in..give it 5 minutes and it continues to blow cold air. Three times replacing the thermostat fuse on both. Please let us know the model number of your Samsung Dryer and we can assist. If it blows the thermal fuse… then clean the inside of the wall… either use a vacuum with an attachement to get in there as deep as possible or if the clog is too deep you may need to call a vent cleaning company. We have seen this many times before… if your dryer can’t vent out the hot air, it will not function properly and eventually blow the thermal fuse. Let us know if cleaning out the wall vent fixes your issue. I have the dv317aeg samsung dryer.. i cannot see the red in the back of the dryer when running it under timed dry (temp) high. I figure that the heating element is bad. Can i make that assumption due to these circumstances? If so, how can i go about fixing this? I have a Samsung model and it had stopped generating heat. I pulled out the lint screen that is located under the front lip of the door opening and there used to be a flat crescent shaped piece of plastic that was hinged onto the screen itself that had vanished a few months back. We figured someone had broken and lost it but had not thought much more about it. Since I have very long thin hands, I reached a couple of fingers deep into the slot and managed to find the piece — both plastic tabs had broken off that attached it to the screen. Looking at it, I figured out that it was a necessary part to keep lint from escaping into the space between the dryer outer shell and the interior wall. They had one of those long flexible lint brushes so I started fishing around in that space through the vent screen slot and found a ridiculous amount of lint had built up during those months on both sides of the slot. In fact I ended up filling an entire bathroom sized wastebasket with dense clumps of lint that kept coming out — there was enough to make a block of lint the size of two loaves of bread! Once we had cleared it all out and reattached the plastic crescent to the lint screen with some fine metal wire, the dryer worked absolutely fine. If you have a Samsung dryer with this two-piece lint screen, make sure the smaller part has not fallen off and gone down between the walls. Overheating from lint blockage that trips the heating element relay (to prevent fires) is one of the most frequent problems I see with dryers. And with some dryers the relay itself just freezes up. You can sometimes correct that by removing it and literally banging it hard on a workbench top or floor a couple of times. I fixed my dryer last Fall doing just that. My dryer is only 14 months old. The high limit switch is out. I don’t use the dryer but once every other week maybe an hour. I have had Samsung washer and dryer in past. Never had a problem like before. I have to spend 172.00 dollars to fix ridiculous. 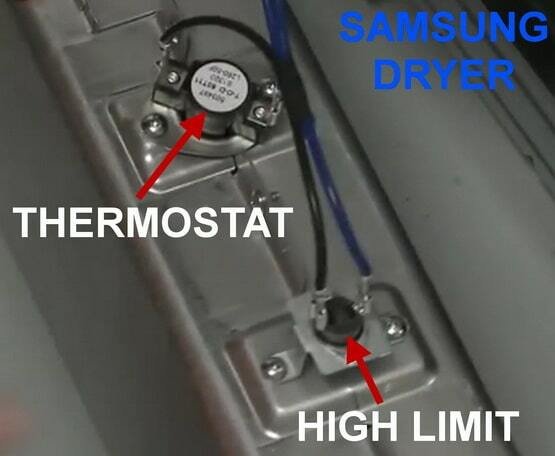 Why not just purchase a Samsung Dryer OEM high limit and install it yourself? I cannot readily access the rear of the dryer. I was told I could remove and replace the heating element without accessing the rear of the dryer. Can you please verify whether this is true or not. Changed heating element, thermal cut out fuse, and thermostat…had heat for about 5 minutes and then no heat…what is causing this problem? I’ve cleaned out all the vent, so something is tripping the fuse. Thermistor, located on back side of blower under drum.